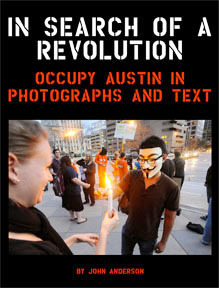 This is an interactive PDF file of In Search of a Revolution: Occupy Austin in Photographs and Text which documents the activities of Occupy Austin, a group in Austin, Texas who participated in the international movement created by Occupy Wall Street. The book is presented chronologically and begins with the first day of their encampment at Austin City Hall. It includes photographs of marches, arrests, assemblies, court trials, the camp itself and even law enforcement infiltration. Throughout the book, there are links to the original "Austin Occupied!" photo gallery on The Austin Chronicle website where this project started. That gallery contains over 1000 images and each link corresponds with the dates listed in this book. Also included are links to articles and other materials. File is large. Please allow at least 5-10 minutes to download. "Occupy Austin: The Encampment Months"